Strong and long lasting. 2 times more efficient*. Anti-grease system so stays cleaner for longer. Specially contoured nailguard for improved grip. Versatile sponge scourer. 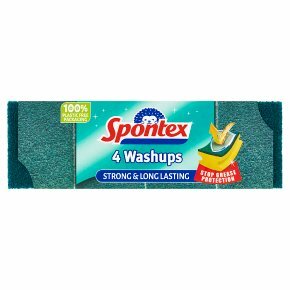 Spontex Washups Sponge Scourers are now more efficient than ever before, in fact they're twice as efficient as the previous Washups! They're still versatile, strong, long lasting and made with the same great anti-grease technology so the scourer does not retain grease and stays cleaner and efficient for longer. On top of that, they are designed with a specially contoured nailguard for improved grip and protection. Ideal for everyday washing up and lots more! *The scouring side is twice as efficient as previous Spontex Washups. Comparative test made in September 2017.